Since the first iPad arrived in 2010, usage of Apple’s tablet(s AAPL) has been mostly concentrated on browsing the web, checking email, using apps, playing games and reading. But a subtle change took place with the release of the third-generation iPad this year: buyers of the new iPad are more likely than ever to use it for work, according to a new report from Consumer Intelligence Research Partners published Thursday. In the four months since the new iPad went on sale, usage has increased across most categories that CIRP tracks: using the iPad for social networking, web browsing, and apps, but no category of usage saw a bigger bump than business. According to CIRP’s research, 21 percent of owners of the new iPad say they use it in a work situation, which is more than the 13 percent of all iPad owners who say the same. Social network use is also more common with the new iPad owners, with 16 percent reporting they use the new tablet for that activity, compared to 11 percent of all iPad owners. Of course, there’s nothing inherently more “business-like” about the iPad hardware itself — the main upgrades to the new iPad are a 4G connectivity option, a faster processor and a Retina display. Sure, those features can be useful for professionals. But this is really a function of better software. iOS app makers are increasingly embracing the iPad and delivering apps that cater to businesses and professionals — in the last year, there have been hundreds of new apps released for conducting meetings, collaboration, creating reports, gathering data (subscription required) and keeping tabs on the stock market. 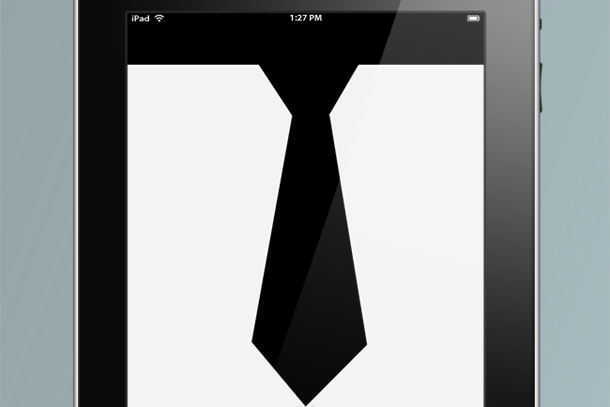 Plus, enterprise BYOD is a very real thing, and businesses have started to embrace it. So, as IT budgets have been opened to buying iPads, and people find more apps that make the iPad actually useful as a business tool, it’s easy to see why the latest iPad is finding a home at work. 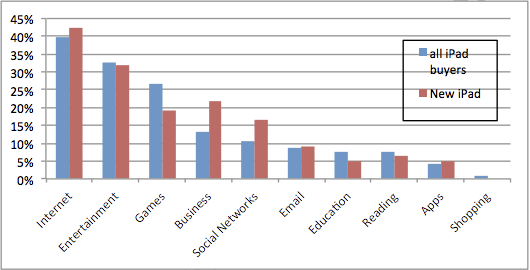 And also, mostly used by women (2012 marketing survey) Money’s here.